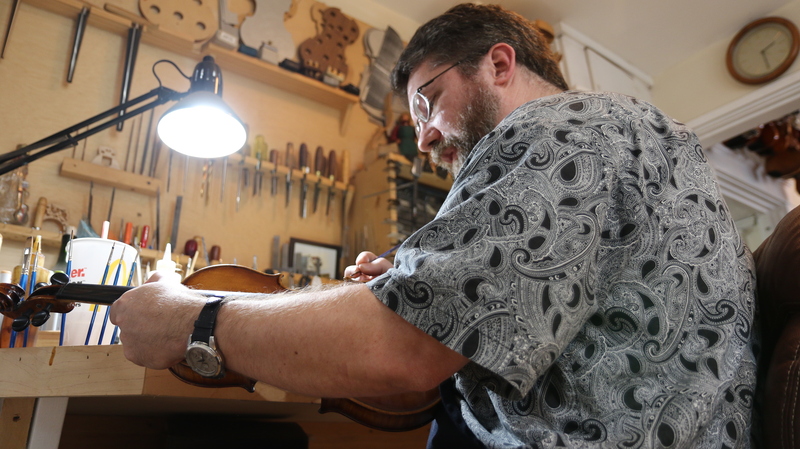 NASHVILLE, Tenn. — After 14 years on Music Row, Williams Fine Violins is expected to move in December to Donelson Pike to a larger building in a location that may attract a more diverse clientele. Dustin Williams, luthier and owner of Williams Fine Violins, said the current space is too small to accommodate his vision. Business has grown and the shop, located in a former house, now serves more than five customers each day, up from four to five customers per week when it opened. Williams added that the move to Donelson Pike from 17th Avenue, expected in December, will put the business closer to its customers. Following a series of delays, Williams was in final negotiations with the bank in May to secure a massive loan to set up a shop twice the size of the current building. He was expecting construction to have begun by summer. “I’m only doing this once. This is it. I’m doing this one big move and I am done… It’s too hard,” he said. The planned expansion has been in the works for years. The business has had two addresses on Music Row since it opened in 2008. 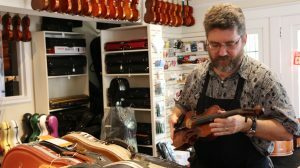 The store, started with three sets of violin strings and four violins, has grown to fill the tiny, cramped quarters with walls of violins, basses and instrument accessories. It is nearly bursting at the seams, with little breathing room in the narrow staircases. Williams said that while he’s happy with how the business has grown, he thought it would have branched out sooner, nearly a decade ago. “Being optimistically naive, I thought this would be easy,” he said. The new building will have six practice rooms, an open room for recitals and classes and additional storage space for new inventory. Services such as renting and repairing instruments and giving private lessons will continue to be available at the new location. “Cradle to grave, everything. But no guitars,” he said. While the move alone carries some risks, Williams is also gambling with bucking hundreds of years of traditional music-making. In the new location, he plans to sell electric violins, which are becoming more common in Nashville, along with amplifiers, effects pedals and other accessories. The inventory will expand one item at a time, and delving into it will require a learning curve for him and his employees, Williams said. “I’m kind of curious, nervous, part excited about it in the future of the new shop,” he said. In addition to serving his existing clientele, Williams hopes the move will diversify his customer base. While he enjoys helping professional symphonies and recording artists at the current shop, he hopes the new location will attract more beginners, seniors and families. “There are people who actually just kind of want to learn how to play… so we’ll be out there and more available to where just average people can start it up,” he said. Kelsey Mo is a junior at Arizona State University and a national political intern this semester at the The Arizona Republic, her CQS internship paper.